Ideal top two draft picks for all 32 teams: Will Cards reunite Sooner stars? Published: Dec. 9, 2018 at 09:34 p.m.
Watch the bizzare ending to the Oakland Raiders' Week 14 win over the Pittsburgh Steelers. 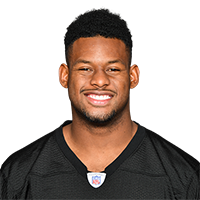 Published: Dec. 9, 2018 at 09:33 p.m.
Pittsburgh Steelers wide receiver JuJu Smith-Schuster hauls in an incredible bobbling touchdown catch vs. the Oakland Raiders. Published: Dec. 9, 2018 at 07:24 p.m.
Pittsburgh Steelers quarterback Ben Roethlisberger squeezes a 1-yard touchdown pass to JuJu Smith-Schuster to take the lead.